Custom black & white staff badges. 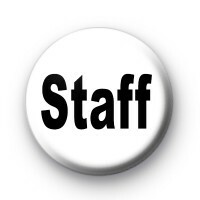 Simple white button badge with black staff written across it. Ideal for schools & team building days. Standard 25mm button badge hand made in our UK workshop.